Whoooo-boy. It’s amazing how ranty people get when you like things they don’t. Or when you critique things they like. Comes with the territory, I suppose, but I’m sort of beyond busy at the moment and haven’t had a lot of time for responding to the Angry Internet, let alone writing new critical posts for them to stew over. So here’s a little article that’s all about joy and celebration. 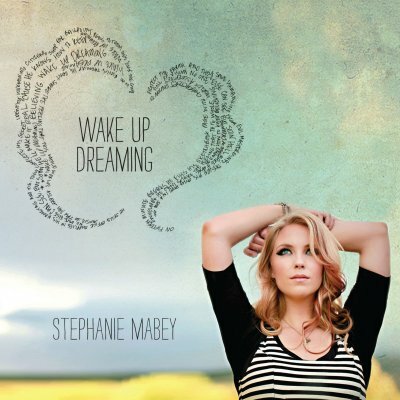 You all need to get your ears on this album: Wake Up Dreaming, by Stephanie Mabey. This album is just a breath of fresh air, joy, and exuberance. If you’re a geek and you love quirky, beautiful, original music, you need this album in your life. I first encountered Stephanie Mabey’s work when Battleaxebunny posted ‘The Zombie Song‘ as part of the Music for the Apocalypse series that I started over at The Girls’ Guide to Surviving the Apocalypse. I have an extensive knowledge of apocalyptic and post-apocalyptic music, but I’d never heard this one before. One of the great things about being involved with this series was actively looking out new songs and finding the indie creators that I’d never hear just listening to mainstream radio, but when Battleaxebunny posted this one I had barely dipped my toe in that water, and it really opened me up to the amazing stuff scrappy creators are doing independently of big business. The narrator warns, perkily, instantly setting the tone – this is going to be both a love song and graphically macabre, but no part of it will be maudlin. It’s not just a pleasing juxtaposition, these first lines trip us from the clichéd, saccharin notion of a ‘love story’ to the equally cliché ridden zombie genre, highlighting how narrowly both are often viewed and how much fun can be had in mashing them together, each using the other to throw its own bounds open to new possibilities. and I’d keep my head. I’d never eat your brain! Honestly, the whole album is worth it just for this song, but after a year of loving this one track, a friend (who had bought the album after I played her the song) persuaded me to buy the rest, and boy, it was worth it. Again, it’s a love song, but the metaphors via which the narrator’s emotional state is expressed are of swinging wrecking balls, having a heart ‘shaped like mushroom clouds’, being ‘wired to delete’ and ‘disassembling‘. We’ve all heard a million songs about people who sabotage their romantic relationships and self-destruct, but rarely is the familiar state of mind conveyed via such distinctively geeky reference points. It’s delightful, and the fairground quality of the melody perfectly chimes with the sense of someone who is queesily out of control in a Waltzer, (rather than the conventional rollercoaster) of highs and lows and unpredictable turns. This song is coming at a familiar idea about love from a new angle, finding extra nuance along the way, and laying out Mabey’s geek credentials up front. Solidarity in exclusion really means something. And isn’t there something universal in that, too? We all want to feel different because our individuality makes us special, but equally we want to find someone who shared all the special things that make us different. And love is like that: that contradiction – needing someone to be like you in the ways that make you unique, unusual, different. Granted, the song’s about a wannabe comic book artist with a boring day job, but I like that it appeals to such a universal trope: to want to somehow ‘wake up’ in the dream world – the one where you’re famous, or rich, or you have the job you’ve always dreamed about – and the encouragement to keep on dreaming, that you might get there if you just hold on… And by likening the ‘day job’/dream binary to the secret identity/superhero one it’s a really clever way of exploring how geeky passions aren’t so very different from so-called ‘normal’ ones. It’s just another way of dreaming of a better life. This is a song with geekery in every beat, but the overall album shifts between the geeky and more universal themes that riff on this thought of the interrelations of apparently niche passions and more generally accessible themes of what it is like to be a human. Stephanie Mabey is a great artist with a beautiful voice turning her talent to the sort of subject matter that, if you read this blog, should be right up your alley. I can’t recommend her work enough, and she’s an indie creator, so if you give her money you’ll be doing a good thing to feed diversity in the arts. Go here and buy her album. It’s only $10 for 11 songs, which is, like, £6.50 at the time of posting in Brit money. BARGAIN. This entry was posted in Awesome Things, Music, Stephanie Mabey, Wake Up Dreaming and tagged geek, geek culture, geek music, geekery, music, review, Stephanie Mabey, The Zombie Song, Wake Up Dreaming. Bookmark the permalink. That’ll be in my head all day now! 😀 Then my work here is done. I have now had all her other songs in my head since I bought the album – a good sign!